I vaguely hinted in a manner that was so subtle I betcha missed it that I was rather fond of the Strictest School in the World series which I reviewed over at 5 Minutes for Books. 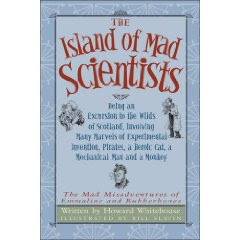 I took the last book in the series, Island of Mad Scientists (The: Being an Excursion to the Wilds of Scotland, Involving Many Marvels of Experimental Invention, Pirates, a Heroic Cat, a Mcechanical Man and a Monkey) with me on vacation last week. This was to be my pleasure reading. Even though I was on an airplane with a two year old, I still managed to get a little bit of this book read, finishing it off once we got back home. Once again I laughed. Outloud. Multiple times and in multiple places. Are you still waiting to go and buy the first book in the series? Why? Give me one good reason. This book is just plain fun. I thought it was a little Wodehousian at times and lo and behold, the author concludes the book with "A Note About People and Places" used in the book. He states that one scene in this book is a tribute to Wodehouse whom Whitehouse says (and I concur) was "possibly the funniest writer ever, who specialized in sheer nonsense at country houses with everyone impersonating someone else and only the butler showing any sense at all." That's pretty much the flavor of Island of Mad Scientists (whichbtwisinpaperbackandisamere$7.95whichisaboutthepriceofamovieticket). This particular story focuses a bit more on Princess Purnah and less on Emmaline. The princess of Chiligrit is trying to escape from Scotland Yard and others while the entire gang (Emmaline, Rubberbones & crew) are trying desperately to get to the Island of Urgghh where a collection of mad scientists live. Only they aren't aware of the fact that the Collector of the scientists himself desires their residency on the island as he has some rather nasty plans in store for Emmaline and Rubberbones. It's another loud and hilarious adventure and I enjoyed it very much. I was also pleased to note that it ended it such a way as to hint at a fourth installment so....please, Mr. Whitehouse!? This book is written for ages 12 and up but I still can't help but think it's better suited for adults. What do I mean by that? It's very Wodehousian. VERY. The humor is very refined and I love that Whitehouse doesn't spend his time "talking down" to the intended younger audience. He writes as he ought to write - using his talents well without apology. The younger reader may or may not get the jokes and the humor which, in some ways, would be disappointing. I think a 15 year old would best grasp the adventure and tongue-in-cheek dry humor which is displayed throughout this series. It certainly is a fun adventure break for my adult self. I LOVE it! There was the subject of a seance in this book which I don't think I can pass by and not mention. However, Whitehouse handled the situation in a manner which clearly makes the reader aware of how silly the seance is. He plays it up in a funny, ridiculous manner that didn't put me on edge or bother me at all. (Normally that type of subject matter would get my back up against the wall a bit.) Truly though I think he did a good job of making a mockery of it and kept things light hearted and funny in that respect. If you want a break from the norm, start with Strictest School in the World . I doubt your disappointment. Well you definitely have me interested. Sounds like something my daughter and I would enjoy together. Thanks for the review. I like your subtle nudge to read this series. Now you've got me curious. Sounds great! When I was cleaning out some books, I found this, and I have the first one (I think). I am trying to do a better job of reading aloud to Amanda, so I think that I'll start with that first book I think! !